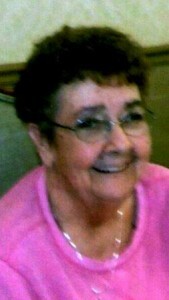 Shirley Ann Tkacik, 80, of Clearfield and formerly of Curwensville, died Friday July 3, 2015 at the Mountain Laurel Nursing & Rehabilitation Center in Clearfield after a lengthy illness. Born July 3, 1935 in Bigler, she was the daughter of Burton and Geraldine (Millinder) Hummel. Mrs. Tkacik was a homemaker. She was a member of the St. Francis Roman Catholic Church in Clearfield. On April 14, 1956, she wed Edward J. Tkacik. He preceded her in death on June 3, 2007. She was also preceded in death by her parents and a brother, Burton Hummel Jr. Surviving are twin daughters, Cindy Anderson and her husband, James, and Sandy Hutton and her husband, Thomas, both of Clearfield. Also surviving are three grandchildren, three step-grandchildren, six great-grandchildren, two great-great-grandchildren and two brothers, Gerald “Buzz” Hummel of Clearfield and Steward “Stuke” Hummel and his wife, Betty Jane of Delmont. Funeral services will be held at 10 a.m. Tuesday at the Chester C. Chidboy Funeral Home Inc. of Curwensville with Deacon Robert Wilson officiating. Burial will be in the Bigler Cemetery in Bigler. Friends will be received from 3 p.m. – 5 p.m. and from 7 p.m. – 9 p.m. Monday and from 9 a.m. – 10 a.m. Tuesday at the funeral home. Contributions may be made to the family in care of the Chidboy Funeral Home Inc., 300 State St., Curwensville, PA 16833.